Dana, Veera, Soora Karna(Generous, Brave and Courageous) is a man ‘True to his Salt’. But for his unflinching loyalty to his benefactor, the Story of Mahabharata would have been different. The Book of Matthew, Chapter 5, verse 13, reads “You are the salt of the earth. But if the salt loses its saltiness, how can it be made salty again? It is no longer good for anything, except to be thrown out and trampled by men. “A man without character should be rejected. Dr. Martin Luther King wished for the day when his sons would not be judged by the color of the skin but by the content of their character. Character is defined as the combination of qualities or features that distinguishes one person, group or thing from another. Character is a description of a person’s attributes, traits or abilities. 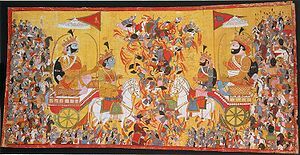 In the Indian epic of Mahabharata, Prince Karna is allied with the enemies of the Pandavas. Karna is the first son of Queen Kunti and is the half brother to the Pandavas and is the eldest of them. However, Queen Kunti abandoned him after his birth and he is known as ” Radheya” and as ” Suta Putra ” as he grew up in the house of a charioteer. Karna sought a position at the court in Hastinapura. His identity as a low-caste person came in the way of his quest for knowledge and mastering the art of archery. Dronacharya the teacher of Kuru princes has refused to teach him. Later, Dronacharya held an archery contest at Hastinapura and Karna is publicly humiliated as he is made ineligible to participate in the competition for he has no princely status. Duryodhana, the eldest of the Kaurava brothers comes to the rescue of Karna. He immediately appoints Karna as the King of ‘ANGA’ province and makes him eligible to participate in the archery contest. Thus Karna becomes a true friend and a loyal ally of Duryodhana. Karna fought for the Kauravas in the great battle at Kurukshetra. Because of the fear of the impending battle, Queen Kunti approached Karna and for the first time reveals her identity as his mother and calls him as “Kunteya”. The true character of Karna comes out when he tells his mother that he must fight the Pandavas but promises not to kill any of them other than Arjuna. On the 15 th day of the battle, Karna is appointed as the Commander and Chief of the Kaurava forces. Karna braved impossible odds in his whole life and died with great courage, valor and honor. It is Karna’s fate to be sacrificed in a climatic battle with Arjuna. It is a death that is a reminder of the necessity of sacrificial destruction for redemption. The dignity with which Karna conducted his life makes him my favorite hero and I would claim that Loyalty, Dependability and Trustworthiness is the bench mark of Indian Identity. The essence of salt exists in its flavor and if salt loses its taste and flavor, its existence has no purpose and it would be discarded. A man has to define as to who he is, his true nature and his existence would be valued as long as he retains the flavor of his essence. The reality of existence is a prerequisite for having essence and a man of character and integrity would only exist to display his true nature. To many of us who have the privilege to serve in Uniform, nothing is really more important than being ‘LOYAL’. Many had cheerfully accepted the test of Loyalty and willingly sacrificed their lives in the discharge of their military duty and I am proud to describe this as our national character and as our true Identity. SURYA,the sun god is the very basis of life on this planet; as we extol in ‘Aditya Hrudayam’ the sun gives rain,seasons,energy, life to all living things; Surya only gives and as the son of sun,Karna became Dana veer soora karna; he became immrotal by his dana karmas and even excelled his father; there are two stories that Praise this virtue of karna,may be apocrypal,but yet endearing which i will relate here. Once a brahmin approached him with a request to provide him with dry fuel to perform the last rights of his father,as due to rains all wood in the forest has become wet;karna ordered that his house be dismantelled to provide wood to the brahmin. In another episode he was taking an oil bath when lord krishna came to meet him;seeing an exquisite diamond-studed vessel containing the oil krishna expresses a desire to have the vessel;karna immidiately hands it over to krishna with his left hand as he had oil in the right hand;krishna expresses his surprise for giving danam with the left hand ; karna tells him that danam should be done with the least delay and who knows if he will live to make it if he goes to wash his hand!! !i think krishna did this to highlight the gratness of karna,and to state the proverb’he gives twice who gives quickly;i am an admirer of karna for his quality of dana;his association with wrong doers like kauravas may be due to his past life. I also greatly admire the qualities of Karna and his spirit of generosity and the story about giving ‘DANA’ with his left hand is really good.His unflinching loyalty to his benefactor is an attribute which I would describe as ‘national character’.Jesus described this in His Sermon on the Mount(Book of Matthew,chapter5,verse 13.”You are the salt of the earth.But if the salt loses its saltiness,how can it be made salty again? It is no longer good for anything, except to be thrown out and trampled by men.” Indians,Hindus,Muslims and Christians are afraid of the phrase “NAMAK HARAAM”.A person who is not true to his “SALT”(his provider)should be rejected.It is claimed that the only noble act of Duryodhana in his life time is that of awarding the kingdom of ANGA to Karna and an evil person like Duryodhana deserve to be served with utmost loyalty as that sense of loyalty is a character issue.